Industrial Training for a period of 90 days and Industrial Tarining Viva-Voce. Eligibility:A Pass in any degree course. Eligibility:A Pass in B.Sc. Computer Science/Computer Technology/Information Technology/Software Systems/Electronics/B.C.A. Eligibility:A pass in B.Sc. Mathematics / B.Sc. Mathematics (CA). Eligibility:A pass in B.Sc. Computer Sciences / Computer Technology / Information Technology / Software Systems / Electronics / B.C.A. Eligibility:Bachelor�s Degree from any recognized university. Eligibility:Bachelor�s degree in any one of the following disciplines: Life Science / Chemical Sciences / Physical Sciences / Mathematics / Statistics / Veterinary Sciences / Fishery Sciences / Agricultural Sciences / Medical, Paramedical and Pharmaceutical Sciences /Food and Nutrition Sciences / Food Chemistry / Food Technology / Computer Science / Information Technology / B.Tech. Biotechnology / Forestry Science / Environmental Science. Eligibility:B.Sc. Physics with Mathematics as one the allied subjects or B.Sc. Physics with Computer Applications with Mathematics as one of allied subjects. Eligibility:B.Sc. Chemistry with Physics / Mathematics / Zoology / Botany / as allied subjects. Eligibility:B.Sc - Botany/Plant Biology and Plant Bio Technology /Plant Science / Biology. Eligibility:B.Sc Zoology / Animal Science and BioTechnology / Animal Science / Advanced Zoology & Bio Technology / Applied Science / Life Science. Eligibility:Any Bachelor degree in Science / Engineering / Medicine / Agriculture / Fisheries Science/ Veterinary Science. Eligibility:Any graduate in B.Com./ B.B.M. /B.B.M. (CA) / B.B.A./ B.C.S. /B.C.S. (CA)/ B.Com.(CA)./B.Com. (e-Commerce) / Bank Management. Eligibility:A pass in B.A. English Literature or any graduate with part-II English in UG level (with four semesters). Eligibility:A pass in any degree. Eligibility:A pass in any degree with Mathematics at +2 level or any degree with atleast one paper in Mathematics or Statistics at degree level. The University named after the great national poet Subramania Bharathi is enshrined with the motto "Educate to Elevate". In the University, every effort is harnessed to realize his dream of making educational institutions as temple of learning. It is the aim of the University to participate in the task of inculcating necessary Knowledge, Skills and Creative Attitudes and values among the youth of the country to contribute more effectively towards establishing an equitable social and economic and secular ideal of our nation. 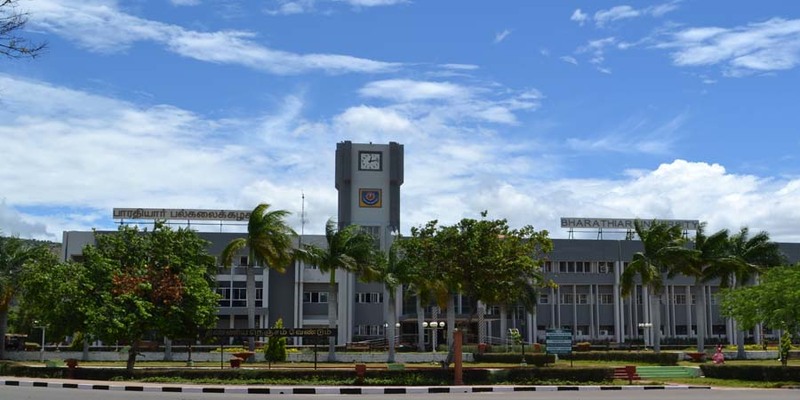 The Bharathiar University was established at Coimbatore by the Government of Tamilnadu in February, 1982 under the provision of the Bharathiar University Act, 1981 (Act 1 of 1982). Bharathiar University offers the various IT related UG,PG, Diploma and PG Diploma programmes.